Middle East Perspectives by Rick Francona: Al-Qa’idah - an “unintended consequence” of American operations? Al-Qa’idah - an “unintended consequence” of American operations? During a segment on MSNBC’s Hardball, legendary former Central Intelligence Agency (CIA) officer Milt Bearden had an exchange with host Chris Matthews about possible unintended consequences of American covert support to the Afghan mujahidin fighting against the Soviet occupation in the late 1980’s. 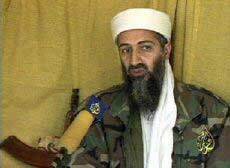 Chris asked if our support of Arab fighters who went to Afghanistan, who were trained and equipped by the CIA, including Usamah Bin Ladin (photo), ultimately led to the creation of Al-Qa’idah. Bearden, who was the CIA Chief of Station in Pakistan from 1986 to 1989 and was a key figure in the support to the effort in Afghanistan, clarified American support to the mujahidin. I was assigned to the Defense Intelligence Agency during the last two years of the Soviet occupation of Afghanistan. Our office was indirectly involved in the Department of Defense (DOD) support to the CIA Afghan Task Force (ATF). The ATF was responsible for providing the three things required for any successful insurgency – money, weapons and training. The key point Bearden made concerned just to whom the ATF provided the money, weapons and training. The recipients were the Afghan mujahidin, not the Arabs who came from across the Arab world to join the fight. Yes, Usamah Bin Ladin was there, as were hundreds of other Arabs, but they were not funded, equipped nor trained by the CIA. They were funded mostly by Saudi Arabia. What about the “Afghan Arabs’,” as they came to be known, weapons and training? Here is where the story gets a bit messy. In order to provide support to “the muj” in Afghanistan, the CIA needed access to the country. That access came via the Pakistan, specifically the Directorate for Inter-Service Intelligence (ISI). Virtually all American support to the insurgent effort in Afghanistan was funneled through the ISI. Despite CIA attempts to maintain strict control over the money and weapons, it was inevitable that some of it was channeled elsewhere – some to Pakistani pockets and some to support the Afghan Arabs. Some of it may have even ended up in the hands of the Pakistani backed militants in Kashmir. It is Pakistan, after all. A definite unintended consequence of the effort involved the provision of the extremely effective American Stinger shoulder-launched surface to air missile system. Despite warnings from DOD about the danger of the Stinger falling into the wrong hands, Texas Congressman Charlie Wilson was able to force its provision to the mujahidin. DOD’s fears were validated in 1987 when Stinger parts traceable to the ATF effort were discovered on Iranian Islamic Revolutionary Guard Corps vessels in the Persian Gulf. The bottom line, according to Bearden, was that the United States never provided money, weapons or training to the Arab fighters who ultimately created Tanzim Al-Qa’idah (“the base organization”). That said, Chris has a point. Was the creation of Al-Qa’idah by Arab fighters an unintended consequence of American support to the Afghan mujahidin? Perhaps. That does not mean we should not have done it.